Lt. Tuck Pendleton (Dennis Quaid) is your typical sterotype American movie soldier, full of bravado and a little maverick, but at the end of the day a good guy. Tuck volunteers to test pilot a new scientific breakthrough – a pod named the Kraken II that can be shrunk to microscopic size and injected into living things to aid in medical procedures and the like. Unfortunately, on the day of the test, a group of terrorists attack the lab where the research is happening, and instead of being injected into a rabbit, Tuck finds himself accidentally placed inside unwitting civilian Jack Putter (Martin Short). Tuck makes contact with Jack by hooking the Kraken’s radio up to his ear drum, as Tuck realises he will need to get out before he runs out of oxygen. Jack is a massic hypochondriac and initially believes he is going mad hearing voices, but soon calms down enough to accept the situation. Just in time, in fact, to be kidnapped by the terrorists who insert their own shrunken pod into him in order to try and flush out Tuck. After fighting off the enemy pod and disposing of the terrorists using Jack’s bodily fluids (urgh!) Tuck alters Jack’s facial features by using the pods systems to stimulate his facial muscles. OK, this is a little far fetched, but it fits in nicely and is accompanied by Martin Short doing some great panicked face contortions as the change is carried out. 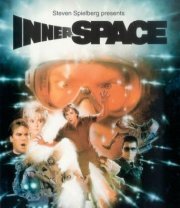 Innerspace takes the premise set up by the 1960’s film Fantastic Voyage and gives it a face lift and tummy tuck. It was produced by Steven Spielberg and directed by Joe Dante of Gremlin’s fame, and is a gloriously silly but fun movie. It does stretch the science a bit at times, especially when the pod is transferred between Jack and Tuck’s on-off girlfriend Lydia (Meg Ryan). This involves Jack and Lydia kissing, which transfers the pod not once, but twice! The only reason this scene is in there is to let Tuck know he is about to become a father, as he discovers the fetus growing within Lydia, which makes him realise what a jerk he has been to her. Give it a whirl! It’s great fun, and the main cast all put in good performances. This entry is filed under Films - Teens	and was posted on October 22nd, 2007. You can follow any responses to this entry through the RSS 2.0 feed. You can leave a response, or trackback from your own site. You completely fail to mention the presence of the great Robert Picardo in this film ! Is he in it? Will have to dig out the DVD then for some Energency Medical Hologram goodness! Yeah, he’s the Cowboy assasin.